Brake calipers are one of the three braking system components. And just like the other two, brake calipers are extremely valuable to bring your car to a halt. Therefore, their proper functioning needs to be ensured at all times. Brake calipers work in tandem with brake rotors and brake pads to create friction and stop your car. The brake caliper receives its energy from the hydraulic system which is activated as soon as you press the brake. The master cylinder uses brake fluid to build pressure which forces a piston to move and create force multiple-folds to restrict your car’s movement. As time passes, the brake calipers age and lose their performance. The biggest player behind their loss in performance is heat caused by friction. After all, the brake calipers are made of metal, so they feel the heat the most out of all the other braking components. When they do fail, they start to create a number of problems for the driver and the car, which are easily noticeable. Almost every major function of a car requires fluid or lubricant to work properly. The brake calipers work the same way. They use the brake fluid from the master cylinder to press on the brake rotors, which in turn stop the car. The fluid itself is restricted by a number of seals, however, when they fail, the entire fluid leaks and your brake calipers become unresponsive. The leaking fluid can be seen just below the brake calipers or the master cylinder nearby. You could also inspect brake fluid leakage from inside the engine bay where a container holds reserve brake fluid for emergency use. If that reserve is empty, it means your brake fluid has reached critical levels and you need to either refill the container or visit the mechanic to talk about resealing the master cylinder. The calipers make a very loud squealing noise when they are not working properly. You could also feel the brakes are stiff or very loose at times. If any of the above signs show, you can be sure your car’s brake calipers have failed or are nearing failure. Brakes are supposed to work smoothly without making much noise, yet if they do make noise and you don’t get them checked, the whole braking system can deteriorate pretty quickly. The brake calipers are activated when a piston near the master cylinder extends itself to create force. It is possible that the piston gets locked up in a certain position due to extreme wear and tear caused by heat and friction, resulting in a brake caliper locking in place. A locked brake caliper will cause a car to sway in one direction. Thus, if you feel your car is moving in one particular direction all of a sudden, you need to get your brake calipers checked. And while you are at it, get your sway bar inspected as well, because a problem with the sway bar has the same effect. 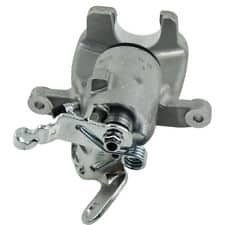 The brake calipers create the force that triggers the car to stop, however, if the brake calipers are loose or not responding ideally, your car could take longer to stop or stop abruptly. When this happens, it is a sign of failing brake calipers, which you should definitely get inspected. A certified mechanic will have the perfect knowledge to deal with such kind of issue. Ideally, it is better to stop a problem in its track before it starts developing with full effect. To do that you need to have the proper knowledge to make a difference. Here we will discuss some methods to test and repair brake calipers. Testing brake calipers are not that difficult since the component shows its failure while you are driving your car. However, a number of prompts can cause a certain problem to happen. Like a swaying car can be caused due to brake calipers but it can also be caused if your car’s sway bars or tie rod joints are malfunctioning. Therefore, the correct tests need to be conducted to differentiate between a brake caliper failure and other things going bad. First off, before you inspect anything mechanical, it is best to remember the basics and check the brake fluid levels. Most times brake related issues arise as a result of low brake fluid levels. Check the brake fluid container in the engine bay and make sure it has the ample amount of fluid. If the fluid is below the critical line, refill the fluid container using high-quality brake fluid. Remember that the brake fluid should not disappear, if the brake fluid is gone, you have a leakage or the brake pads are weared down. Once you have refilled the container, you need to make sure the container’s cap is tightly sealed in place. The last thing you want is the brake fluid leaking while you drive your car. The second test involves you driving the car in a secluded place. It could be an empty parking lot or an empty road at night. Just make sure there are no other cars around or any pedestrians nearby. After you have made sure of other’s safety and your safety (seatbelt), start your car and drive in a straight line. You need to brake frequently and see if any of the aforementioned symptoms show themselves. If they do, you need to look for any other issues. For example, leave your steering wheel for a while and see if the car sways to one side, if it does, your brake calipers are not at fault, since such a motion is caused by faulty suspension components. After doing all that if you still feel you cannot be sure about the problem, you need to visit the mechanic and get a professional diagnosis. Unfortunately, there is not a lot you can do to repair a brake calliper. You can try to replace the sealings, but it won’t always help. The expertise required to do that can only be found with an experienced mechanic. Having said that, brake caliper repairs are not very expensive to repair or replace. A new one will cost you $100-$150 while the mechanic will charge you $100-$150 in labor costs.